Make the right first impression with our entry doors. Whether your current entry door is warped and letting in a draft or is simply outdated and not reflecting your personal taste, Home Solutions of Iowa is here for you. Our stately entry doors are available in numerous styles and colors and are expertly crafted to function properly well into the future. 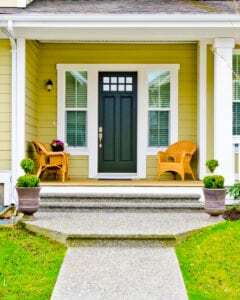 So, you can count on doors that make a great first impression to visitors of your home and that also keep it well-protected. Our entry doors are highly customizable, so you can enjoy designing the perfect entryway for your home, whether you need a single or double door configuration. Your doors can mimic real wood grains, or you can choose a bold color from within the Sherwin William® color catalog. Additionally, there are a variety of opaque and transparent decorative glass options, internal grids and blinds, transoms, sidelites, and much more. To learn more about our entry doors, contact Home Solutions of Iowa today. We will be happy to schedule a complimentary consultation at your home in Des Moines or elsewhere in the state.